“When life gives you lemons …make lemonade.” Don’t you just love last minute plan changes? As to be expected- April showers bring May flowers – so Nick ended up having a “rain day” work cancelation. Which meant – although he’s a day behind in construction, I was able to monopolize his time and drag him out somewhere. Our rainy day ‘go to’ is always antiquing …. but we wanted something different. Not simply an antique store or barn. Antiques and History – perhaps. We’ve been to Lambertville, New Hope, Mt. Holly, New Egypt, and Columbus scores of times. They never fail to surprise us and we almost always come home with something. But today was different. Nick seemed to have stumbled upon the MotherLOAD: a history and antiquing Goldmine – untouched, unheard of and unvisited by the Frosts. DOWNTOWN HISTORICAL BURLINGTON. The webpage boasted: “When you think history – think of Burlington”. We loaded up the car and headed off – mind a flutter with thoughts of undiscovered treasures awaiting for us. Maybe we would finally find that picture for above the couch? Would today be the day we finally found the perfect end table? Alas – our dreams were not to come to fruition. To our disappointment – Downtown Historical Burlington wasn’t quite what we were expecting. Though I did spot a Walter White “Heisenburg” decal on an early 2000’s Honda. Which, I suppose, is just as priceless as discovering a flashy new frame or a valuable vase. After driving past the two museums, with their flags fluttering, challenging us to dart past the few shady characters standing outside – we conceded. Evidently, we were not brave enough to venture out – into the lone, desolate streets of Burlington. Even a guided historical tour and a three story antique store was not enough to get us out of the safety of the Volkswagen. So we re-routed. Off to Bordentown – down 206. We were going to a downtown main street with quaint row houses and quiet bistros if it killed us! And that’s exactly what we did. 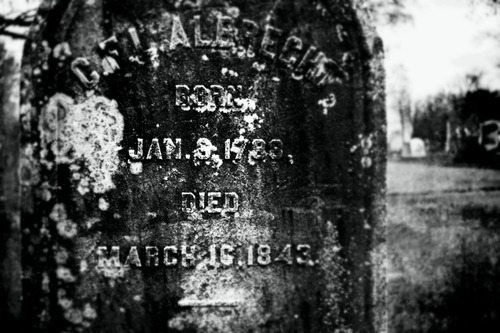 We had a quiet little lunch – at a friendly little Bistro, peeked in some trinket and antique stores, took some photos in a super old cemetery and came back with a story to one day tell the grandkids.